The Vision series comes to a close in this second volume, and it brings all the pathos of a Shakespearean tragedy. Considering my high regard for the first volume Little Worse than a Man and it’s inclusion on my Best Reads of 2017 list, surprisingly it took me a year to pick up and read this second volume. I knew that reading it in one sitting would be best, so the quietly ominous story could have it’s best effect. The conclusion did not disappoint, yet it did have a different feel than the first. The first volume showed how The Vision, a syntheziod, desperately wanted a family and how his creation upended what others considered human behavior. This concluding volume goes back in time and shows The Vision’s rationale for wanting to create a family, and his motives turn out to be a bit complex. The volume opens with his past relationship with Scarlet Witch and how their unlikely romance resulted in marriage. The marriage deteriorates as Wanda’s delusion of having twin boys takes over (this plot point has always been confusing to me as Wiccan and Speed are now real Young Avengers) and a seemingly innocuous joke between the two builds and carries through to the end. It seems The Vision’s love for Wanda and her wish for family subverts itself in his later wish for the same thing, and how he creates his new wife Virginia. When we are in present day we see twins Vin and Viv (again a connection to The Vision’s first twins) and Vin’s obsession with quoting some of Shakespeare’s work. A quote from The Merchant of Venice bring volume one and two’s titles into focus, “When he is best he is a little worse than a man, and when he is worst he is little better than a beast” and we know that the story is building towards an unhappy climax. Themes of destiny and intentions are interwoven throughout the narrative, with many of the Avengers coming off negatively, with many injustices heaped upon the Vision family by them. Decisions certain family members make in the name of love or revenge, can be connected to their true humanity vs the shaky moral high-ground that others around them take. The art in both volumes is excellent. When The Vision is with his family the panels are precise and clean, with a more sketchy style used when he is out of the house and interacting with others. I believe this a subtle nod to The Vision feeling when he is with his new family he is in control and being less clear when he has to deal with the conflicting motivations of people outside his realm of influence. This two-volume story is outstanding and really subverts the typical superhero narrative. There are many layers to the story and it touches on important themes such as xenophobia, definitions of humanity and love for family. While I feel the first volume was a bit stronger than this second one, the poignant conclusion is a perfect wrap up, and the team that created it deserves major respect. Ling, Tom, Gabriel Hernandez Walta, Michael Walsh & Jordie Bellaire. The Vision: Little Better Than a Beast. 2016. This is one of those series I think of often but don’t return to for many re-reads. I think that has to do with the haunting nature of the narrative. It takes a lot out of me, as a reader. But once it’s experienced, it can never be forgotten. I think this will certainly be one of those series that will withstand the test of time. I think it’s conclusion (with Tom King going on to work exclusively with DC) will only aid that too as every issue is a thought-out part of the series. There’s no filler or dead issues here. It’s all intentional. It’s such a brilliant story! I love how it was only two volumes- it didn’t drag the story line out. The conciseness made the narrative stronger. 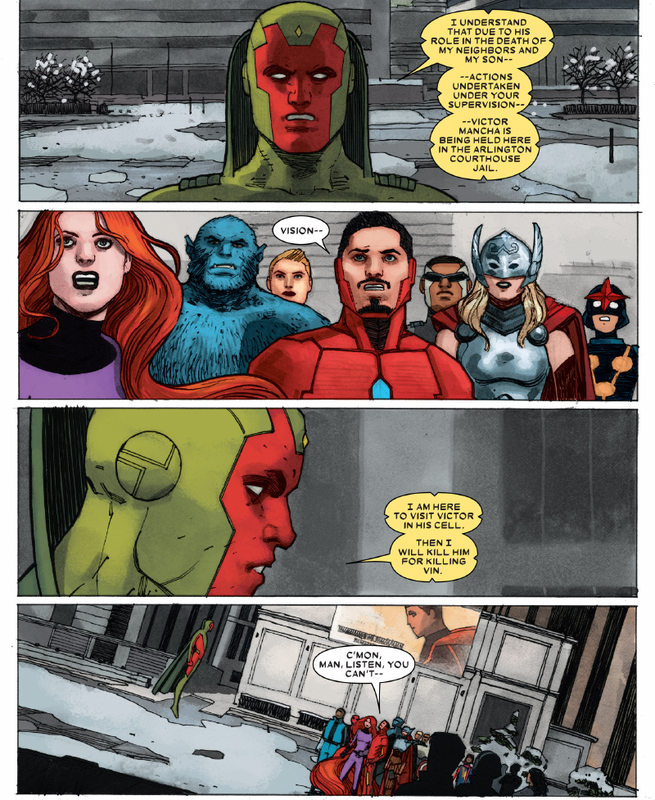 By the end The Vision and his family showed more humanity than almost anyone around them.